Ontech Systems provides efficient, reliable IT support services to Brown Deer based businesses as well as the Greater Milwaukee area. Looking for reliable Brown Deer IT support for your business? All businesses, both big and small, face the same challenge when their network fails – employee productivity and profitability come to a screeching halt. And when that happens, you need reliable IT support and you need it right away. At Ontech Systems, our technicians provide the best service in the industry. Our 98% client retention rate over the past 10 years is proof of our commitment to helping Brown Deer businesses like yours stay on top of their IT needs. Whether you need a VoIP provider, offsite backup and disaster recovery or managed IT services, we are here to serve you when and where you need us. What makes Ontech the first choice for IT support in Brown Deer? Communication on your level: Not everyone has the same level of IT knowledge, and we understand that. We want you to understand how we are supporting your IT needs, so make sure to talk in language you understand, not technical jargon that sounds impressive, but tells you nothing. Efficiency and response time: When you contact us within normal business hours, we will reply promptly by phone or email within 1 hour, not days or weeks later. When your network is down, your business could be losing money. Our clients love that we always respond to their needs in a timely manner. But don’t take our word for it. See what they have to say for yourself. Pro-active approach: We take a pro-active approach to IT support. Our technicians will integrate your overall business goals and long-term growth potential into your IT support plan. Confidence in our ability to over-deliver: You don’t have to sign a contract to benefit from our superior service. Rather than locking you into a long-term contract, we over-deliver on your expectations from the very beginning. How do you get started with Ontech? Just contact us to schedule a free, no-obligation Network Discovery. We will evaluate your current network and suggest technologies to improve the productivity and efficiency of your employees and network. As a first step, one of our technicians will audit your network, infrastructure, server, PC’s, backup and security performance. Following the audit, there is question and answer session designed to help you understand how we can improve any vulnerabilities or enhance employee productivity. Request a No-Obligation, Free Network Discovery! 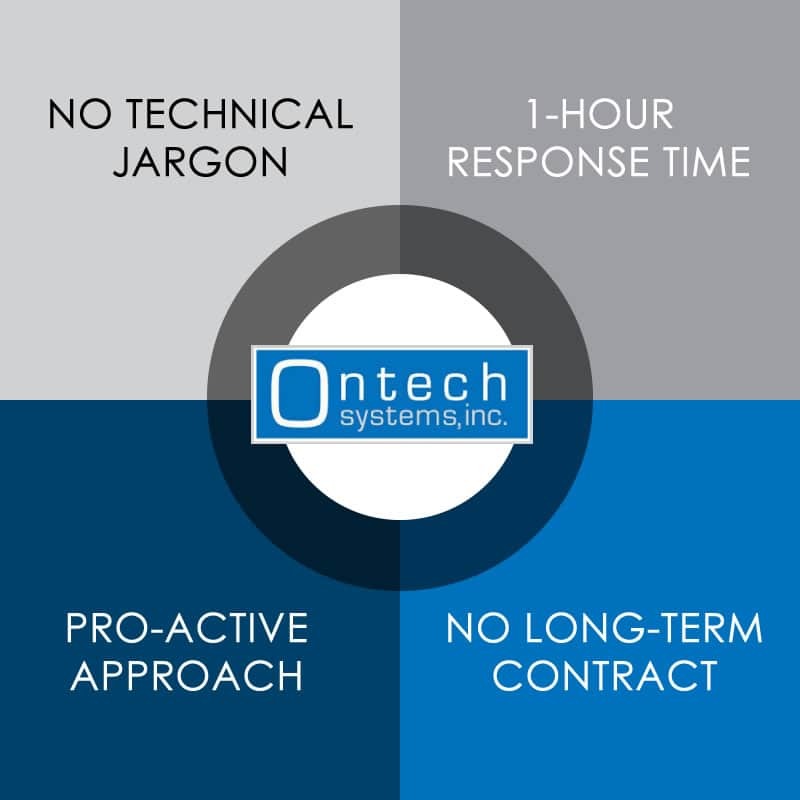 Call Ontech Systems at (262) 522-8560 or email us today to request your no-obligation, free network discovery. Our IT consultants understand that business, not technology, is your priority. We will custom tailor practical IT solutions that align with your business goals and budget, not the latest and greatest technology that won’t bring you a return on your investment.